This interview took place on: 4/3/06. Jesus freak Hideout (John DiBiase): How’d you get started in music? 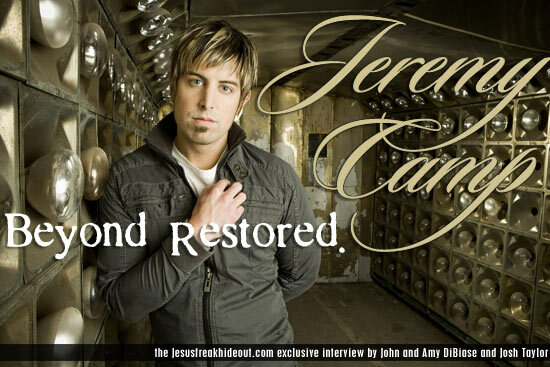 Jeremy Camp: Omigoodness. When I was a small kid, when I was fifteen, my dad always played music and he didn’t do anything in the industry, but he used to play around and he’d use it as a tool of ministry, so that was my experience of music. And back in the day I listened to Mylon LeFevre and they’d be preaching it, so in everything I knew music was a platform to share. It was what I saw and what my example was. I played sports all my life, picked up guitar when I was fifteen just because my dad played and was jammin’, learning some chords. Then one day I wrote a song and played it for my parents and they were like, “You wrote this song?” and I’m like “yeah” and I wasn’t walking with the Lord then so it was a song that was kind of like crying out to the Lord and they’re like, “what’s going on?” and I was like “I wrote it for my sister. I wrote it for April!” *laughs* It was called “Set Me Free.” Y'know, *starts singing* "set me free, free from sin…" and they’re like “what’s going on?” and I’m like “nothing.” *laughs* I was kinda masking it. But then I kept playing and jamming and learning and I just gave my heart to the Lord and starting writing songs and from there, God just started opening doors for me to start playing. Went to Bible college, played at Bible college, did worship, and the kids that went to the Bible college would tell their churches about me and I started playing at all these places until I was playing so much I just did it full time randomly. It wasn't like I was trying to do it full time, I was just getting a ton of calls and it was the best way to do it. When God’s leading and directing, you don't have to kick the doors open. It’s so nice. Basically, I just kept doing that independently and the record company I’m with now, BEC, was like “Hey, can we hear a demo?” Sent them a demo and the owner called me right away, Brandon, and he’s like “Dude, What's up man? We want to sign you, man” and I’m like, “Oh, alright. Well, let’s talk!” So we took awhile and did the long negotiating thing and that’s kinda how it all happened. God just kept opening the doors and I was like, obviously this is what he wants me to do. JFH (John): So the labels sought you out? Jeremy: Yeah. (John: Really? How’d they hear about you?) One of the A&R’s, Tyson from BEC, had a friend that played worship at a big church in California and he’s like "Hey man, we’re trying to look for someone to help do this worship thing we do every year called Any Given Sunday” and he was like “Oh I know this guy, he’s awesome” because I went to the same church this guy went to. And he’s like, “check him out.” So they started hearing about me and were like “Hey, send us a demo. Scott told us about you.” And that’s what happened. Isn’t that crazy? That's what got me going. I look at it now and I’m like “Holy cow, that’s how it started.” And to think that’s where God has taken it and that’s what’s nice because you know it’s God’s hand that has led to this point. JFH (John): You have a new record coming out in the fall right? Jeremy: Yeah, October 31st. Halloween. JFH (John): Do you have a title for it yet? JFH (John): What can we expect it to sound like? Jeremy: I definitely pushed myself vocally and musically. You know how all my albums are, I write some up beat songs, some rockin’ songs, or I write some, whatever. It’s still that, it's me, but I pushed myself in a lot of ways. Does that make sense? (John: Yeah) 'Cause I write what I write. Like, if I’m writing one day a full rock album, then that’s how I’m gonna write, but it always comes out how it is. But I experimented a lot more with my falsetto and stuff like that, you know what I mean? (John: Yeah) But lyrically it’s the same. It’s just me, you know? It’s a new chapter of my life. The song “Beyond Measure,” the title track is basically taken from, you know, Ephesians, “He gives us exceedingly, abundantly above all we could ask or even imagine.” It’s like, that’s what I feel and I feel like that’s the next chapter of my life. Man, just that abundance of what God has done. And that’s what I want to represent as a new chapter in my life. (John: That's awesome) My wife has, of course, an album coming out in September (JFH's Josh Taylor: Does she really?) Yeah, end of September. (John: C'mon man, where've you been?) I don’t know what day. (John: September 26th, I saw the banner.) Oh nice. You know! Thank you. *laughter* (John: It’s called Don’t Wait and she’s going by "Adie," right?) Yeah, A-D-I-E. There you have it. It’s awesome. Not being biased or anything, but it’s pretty amazing. JFH (John): What's her stuff going to sound like? JFH (John): What producer did you work with on your record? Jeremy: Well, we’re still working but (John: Okay) Ron Aniello - he did stuff for Lifehouse. Aaron Sprinkle again. Gonna do Brown Bannister for a couple maybe. Yeah like that. But a lot of Ron Aniello for sure. Totally different thing we’re trying. Never done it before so I think we’re gonna use Aaron a little bit cause he did some good stuff on the last album. JFH (John): Do you already have plans to take this record mainstream? Jeremy: Yeah, but we’re, you know, it’s one of those things where it’s still gonna be God directing but it just seems to be going that way. But I’m still writing. The songs are still what they are, you know, I just write what I write and they’re bold. You know what I mean? (John: That’s awesome, dude) We’ll see what happens. A comment last night was, “If the song’s there and it tests well," you test it you know, "then we’re one hundred percent for it.” Which means that it’ll be awesome, so we’ll see. But I don’t know what’s gonna happen. It’s cool because I wouldn’t be bummed, which is nice. I’ll be stoked. It’ll be like, “cool this is great, it’s another opportunity.” But it just seems to always have kind of gone that way. Like when I first started I actually showcased for Columbia and it went really well but they guy I showcased for ended up moving to a different record company and it was a smaller one and I’m like “I’m not going to take this big leap unless it’s super legit.” So it’s always kind of been there but I’ve always kind of been like "Nyeh." We even started pushing a song two years ago and we just were like, “No. More time.” [It was] "Right Here." We were like, "No." On a couple of stations, it started going well, but then we just did not feel it and no one wanted to put a lot into it. But it’s fine. I’m glad because it wasn’t the right time. It’s not like I’m all ready now but I feel like God's done a lot since then. If it happens I’ll be like, “I know what I’m called to do.” Period. So no compromise will happen. JFH (John): And you have a recording studio in your house, right? Jeremy: Yeah. Well it’s my house [with] a recording studio [next to it]. (John: That's awesome) Yeah it’s pretty big actually. It’s like the legit thing. I recorded most of her (Adie's) album there. I'm going to record half my album there. So I mean, it’s the real thing. Cause I’m like you know what, that’s the best investment you can make. Especially when you have kids being at your house, doing a song. I sent out demos to my record company for my new album and they’re super stoked cause they’re like “Wow you sent out real demos, they sound good.” You know, not just like 'here’s an acoustic and me singing.' It’s like 'here’s drums, bass, guitars, singing, background vocals,' you know what I mean? And I mix it and master it, make it the best that I can. I’m gonna start producing more in the future. I’m gonna probably chill a little bit after doing that and then focus more on doing some stuff with our next record. But I think definitely I’m gonna start producing. (Josh: Maybe start doing a little for BEC?) No, well it’d just be whoever... (Josh: Right.) You know what I’m saying? But maybe like a new band or I might end up starting a record company one day. You know what I mean? Just a small thing. (John: Camp Records) Yeah, Camp. Campground Records. *laughter* I love it. JFH (John): You excel in both rock and worship music. Does one come more naturally to you than the other? Jeremy: I would actually say that the more mellow stuff - the ballads and the worship - comes a little more natural. But if a rock song comes, then it’s natural to play it, does that make sense? (John: Yeah, it does) And that’s why it kinda works because it is me, because I wrote it, I’m digging it, I’m writing it. Like this new album, there’s a song called “Tonight” it’ll be the first CHR Rock song. And full on like different rock song, but it’s rockin’. Because at first I’m like, "I don’t have any rock songs on this next album it’s more like just vibey, medium tempo, groovin’ stuff. But the song came out and it’s like, "Dude! Thank You, Lord." And my record company were like freaking out. (John: Really?) Yeah because you know, that’s just who I’ve always been. Every album has had a song that’s been rock. And they’re like "Well, is it going to continue to happen?” and I’m like, “Should I get someone to co-write to help me write?” and just the song came out and it was just, "Oh. Thank You, Lord!" You know what I mean? And it just keeps coming out. Now, one day if I do a whole rock album, cool, if I do a whole album that’s just chill, whatever. I mean I’m just gonna write what I write. If it’s a mix like it’s always been, then there you go. We’ll see. JFH (John): Are you ever surprised by which of your songs become hits over others? JFH (John): How has parenthood changed road life? Jeremy: You want to be home more. And then when they’re on the road with me sometimes, it’s hard because it’s a different world when you’re on the road. And so you’re trying to intermingle your family with your different life. You know what I’m saying? Like it’s a whole different thing and there’s no schedule really. You’re living on a bus, you know what I mean? People are like, "Aw man, you’re riding on a tour bus!" And it’s like "When that’s your home it’s not that glamorous." I mean it’s the best way to travel but when that’s your home, believe me. Especially having your kids on the bus where they're running back and forth down the bus cause it’s all they can do. I'm like "Aaahhh!" *laughter* So you just take them for walks, take them outside. Like come this Fall my wife’s opening for me on tour, which is cool, kind of works out good, but we’re going to have them set up a room just for the family and kinda have them set it up for that type of vibe. JFH (John): Any advice for new dads? Jeremy: Man, advice for new dads… well I will say that one thing I’ve learned - advice on more of a spiritual side - is that at a very young age you can be that example by if you have delved yourself and just spend time with the Lord and really have that overflowing out of your life, it’s going to pour out to your kids in the way you hang out with them and the way you interact and the way that you love on them, which will nurture them and grow them. But it all begins with your relationship with the Lord and if you don’t have that... Like right now, the other day I was like "Can you say Jesus?” and she’s like “Jesus” and I was like *pretends to cry*. *laughter* I’m like crying because it’s like the best thing in the world, your kid saying “Jesus.” So it made me realize the importance of me being on my face because I’m raising her up to love the Lord so I need to be on my toes and be on my face. I feel like I fail a lot and that’s why I don’t want to look back and have regrets. Just get on your face before the Lord, and do what you’re called to do. Be their father, that spiritual leader and example. JFH (John): What do you find is the most rewarding thing about what you do? Jeremy: Just hearing stories of how God uses the music and the songs to comfort their lives. You know and people have accepted Christ because of songs or something that you’ve heard or whatever. Yeah, that’s the biggest thing. Like awards, the stats, blah blah blah - those things will get you distracted. That’s all they do. That’s all they do. Don’t get me wrong, it’s cool, it’s a blessing, but believe me, it gets you distracted. The greatest reward or award is just hearing people that have been touched, truly, not just like, “I like your music it’s cool” or “you have a good voice” or blah blah blah, "I like your music, it rocks." Nyeh, I don’t really care. I mean, "Cool! Thanks!" But I’m not the type of guy like “Oh, I hope people accept my art.” You know what? That’s not me. I’m not saying it's wrong, I'm just saying it’s not me. I’m like “Has God used this in your life?” Awesome. Then that’s what it’s about. Jeremy: Oh man, there’s this scripture that I read and what I’m learning is that - well my daughter was running around one day and she’s going crazy and I just wanted her to sit in my lap. I was like “Hey honey just chill, just hang out with daddy!” and she’s like "Nah!" running around and it hit me, "Man how many times do I just go nuts? and God’s like 'Jeremy, I just want you to sit at My feet, sit on My lap and just chill. I want you to just be My son'" And as Mary and Martha, when Jesus went to visit them, Martha was going around crazy doing all this stuff and Mary’s just sitting at Jesus’ feet and Martha’s like, “Jesus what’s going on? Mary’s not doing anything” and He’s like, “She’s got it right. Leave her alone, she’s doing it right.” We’re just supposed to be before Him at His feet and He’s like “Okay, slow down, just chill.” That’s a big thing right now. I just need to learn to let God steer the ship and not me, because it’s easy to just take control. (John: Oh yeah, I can understand that too, definitely.) Yeah, because you’re doing well and you’re like “No, I like this it’s going well,” and you start to take control and you’re like “c’mon, God help me” and it’s like - No, He’s supposed to take it and we’re supposed to seek Him and obey and do what He’s called me to do. Jeremy Camp's new album Beyond Measure hits streets October 31st!